This 2-CD set features thirty songs that span forty years of writing, singing and performing. Featuring songs recorded by Chris Simpson as a solo performer (or using a pseudonym) plus his work with Magna Carta this is a splendid career overview. 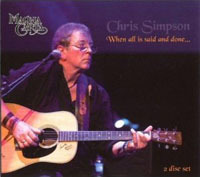 The album features contributions from a variety of musicians including Linda Simpson, Davey Johnstone (Elton John) Paul Burgess (10cc), and Vic Emerson (Sad Cafe).